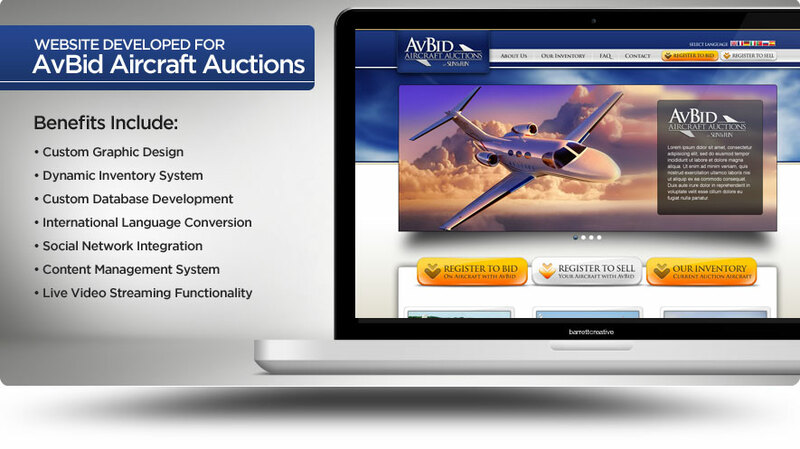 AvBid Aircraft Auctions is a revolutionary company that allows individuals from around the globe to buy and sell airplanes at an auction held every 2 months. Buyers can bid in person, online or over the phone. AvBid contacted Barrett Creative to create a custom web design solution that allows the buyers and sellers to have a seamless experience and get every detail they need to make a decision to purchase an aircraft. Thank you for the tremendous job you did for us in establishing AvBid from its inception to what has become a successful international aviation and marketing/auction company. We absolutely could not have done it without you, and we are truly appreciative, both for you artistic and technical help. We look forward to working with you in the future, both for AvBid and several new companies in our plans. The AvBid website gives each user a great and seamless experience discovering potential aircraft.